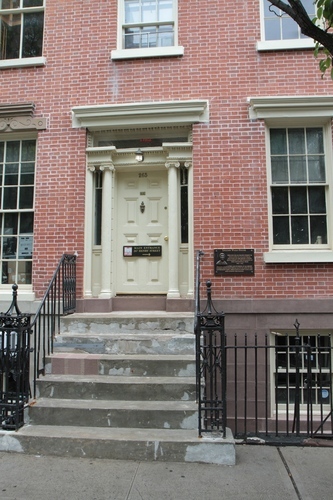 Henry Street Settlement in New York (265 Henry Street) has been a pioneer institution for social and health care services. It was founded in 1893 by progressive reformer and nurse Lillian Wald. 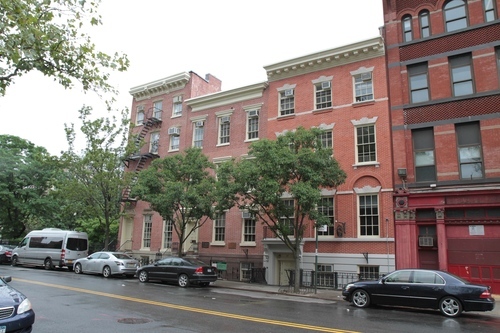 "1893: Lillian Wald “settles in” on the Lower East Side to care for the poor. Wald’s philosophy establishes Henry Street as a national leader in service to children, families, and the poor. 1895: Wald moves to 265 Henry Street during the summer. The building is a gift from Jacob Schiff, who purchased the property earlier that spring and arranged for its repair and furnishing. 1902: The Settlement adds buildings at 299, 301, and 303 Henry Street, which includes a gymnasium. The Settlement opens one of New York City’s earliest playgrounds in Henry Street’s backyard to provide a safe environment for children forced to play in crowded and unsafe city streets. The salary for the first public school nurse in New York City is paid by Henry Street. Her success prompts the Board of Education to appoint nurses in schools. 1908-9: The Settlement opens its first summer camps: Camp Henry for boys and Echo Hill Farm for girls. 1915: The Lewisohn sisters build The Neighborhood Playhouse, one of the first “Little Theaters” in New York City. Between 1915 and 1927, the theater presents plays by Shaw, Joyce, and Dunsany. Now called the Harry De Jur Playhouse, the theater continues to showcase many Settlement arts programs. 1927: The Henry Street Music School opens. Through the years it has hosted and produced hundreds of concerts and operas and trained thousands of musicians. 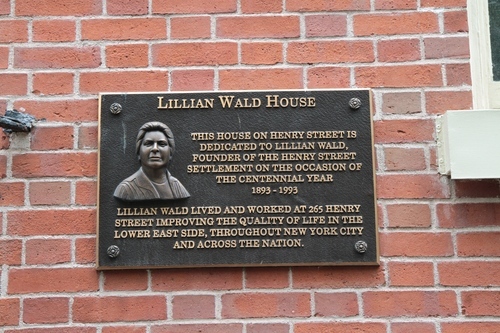 1930: Lillian Wald retires and becomes Director Emeritus of Henry Street Settlement"1. Two memorial plaques, unveiled in 1969 and in 1993, remember the history of he Settlement and of its foundress. 1. 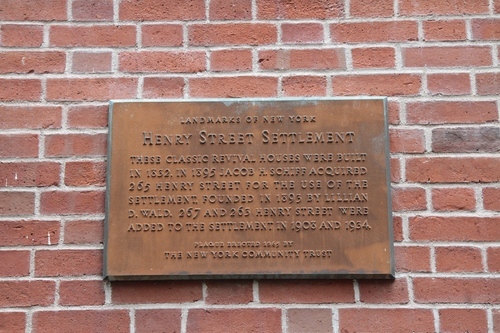 From the Henry Street Settlement's official website.